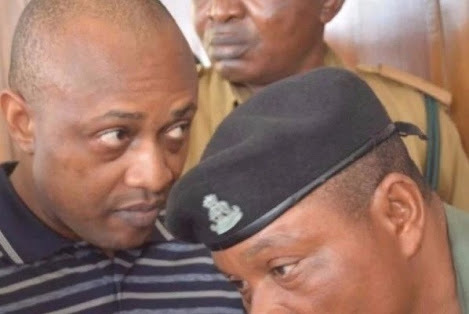 Mr. Izuchukwu Ezeuko, a prosecution witness in the ongoing trial of suspected kidnap kingpin, Chukwudumeme Onwuamadike, aka Evans, on Thursday narrated how he traveled down to the Eastern part of the country to drop a one million dollar ransom to the alleged kidnappers of his rich boss. Ezeuko, a manager in the firm of the victim of the alleged kidnap, Mr James Uduji, made the revelation while giving evidence before an Igbosere High Court in Lagos. Ezeuko, who is the fifth witness in the trial said he agreed to travel from Lagos to the East to drop the ransom in order to save his boss’ life. In the second charge, he is standing trial alongside Joseph Emeka, Linus Okpara and Victor Aduba. At the resumed trial, Ezeuko narrated to the court how he paid one million dollar ransom in two trenches of 800,000 and 200,000 dollars (over N350million) to the rich kidnapper and his gang. Ezeuko who was led in evidence in Chief by the Attorney General and Commissioner of Justice Lagos State Mr Adeniji Kazeem SAN, said that on September 7, 2015, his employer came to the factory at Agbara as he usually does, adding that at about 5.00pm he received a call that his employer who had left the factory for home was kidnapped. However, after some weeks of the alleged kidnap, precisely on October 10, 2015, he got a call from a private number, who said he should speak with his boss. “I went to Festac and met Mr Edwin Uduji, the victim’s brother, who arranged the first 800,000 USD for me to travel with. “On October 11, which was the next day, I drove down to the east with the victim’s elder sister, in the east, a voice gave us instructions on how to drop the money,” Ezeuko said. He said they were made to drive round Anambra state from Awka to Ozubulu, also to Ekwuluobia and the environs till they were asked to stop at Oba. “It was at Oba that the voice asked the victim’s sister to come down from the vehicle with the money. “The voice directed her to an uncompleted building where she dropped the money. it was dark so we did not see who picked the money,” Ezeuko stated. He said two weeks after the 800,000 USD ransom was dropped, the kidnappers released his boss. However, towards the end of October, his boss asked him to take another 200,000 USD dollars to the kidnappers, stating that the kidnappers were still threatening his life. Ezeuko said he took the money down to East and was asked to drop it on the Onitsha expressway by the voice that gave him instructions. However, during cross-examination, counsel to Evans, Mr Olarenwaju Ajanaku, asked Ezeuko if he informed the police that such ransom was to be paid or gave the call logs he interacted with the supposed kidnappers to the police. The witness said he did not inform the police about the ransom before paying and did not give the call logs to the police. Another witness, Sergeant Kingsley Harold gave evidence concerning the first charge in which Evans is standing trial alongside Joseph Emeka, Ugochukwu Nwachukwu and Victor Aduba, for alleged kidnap of Mr Donatus. Harold who was led by Dr Jide Martins said after Evans was arrested, he was asked to make a statement at the Special Anti Robbery Squad (SARS)office Ikeja but Evans said he was not too good in writing. According to him Evans asked me to write the statement for him, the statement was recorded in an open office in the presence of senior police officers and other people who came to the office for other matters. He said that the statement was recorded in a conducive environment between 1400hours and 1530hours, adding that the defandant was cautioned before making the statement. However, the defendant’ s counsel opposed the admissibility of such statement and a trial within trial was conducted to ascertain if such statement would be admitted as evidence. After listening to the argument, Justice Akintoye, adjourned the case until October 8, for continuation of hearing.